These easy to make muffins make great use of foraged fruit. The bilberries, similar in appearance to blueberries, are generously packed into the bake bringing a wonderful aroma and flavour. When Mr E and I have some spare time we often go for a walk in the Yorkshire countryside. Up hill and down dale as they say. Last weekend saw us at one of our local nature reserves walking through the woodland waiting for a shower to pass. The woods were quiet, as is expected at this time of year, as the songbirds are recovering from the enormous effort of raising their brood. Just a few short minutes into our walk a bird made its presence known, and not through the beauty of its song. The bird decided to, well, visit the bathroom at the precise moment that we walked beneath the tree where it stood. Wearing no hat Mr E had been well and truly got! And needless to say he wan’t too pleased about it! Despite Mr E not being too happy about the ‘incident’ it is said to bring good luck. Perhaps he should purchase a lottery ticket for the next draw 😉 Or maybe the good luck was stumbling across the heavily ladened bilberry bushes we found later in our walk. Many of the bilberry fruits had yet to ripen but there were plenty which were ready to be picked. So retrieving a small empty paper bag, which had earlier held bird seed from feeding the mallards, from my pocket I picked what I could. As a child Mum, Grandma and I would often find ourselves on the hills above our family home picking bilberries at this time of year. They’re such a treat. Not only because they need to be foraged for (as it’s very unlikely that you’d find them in supermarkets and greengrocers here in the UK) but because they taste amazing. Really amazing! Although bilberries (which are also known as blaeberries, whartleberry, winberry, wimberry, and myrtle blueberry) look like a mini version of blueberries, they, in my humble opinion, are far tastier than their larger cousin. Wikipedia tells us all about the bilberry, and have a look here for the nutrition of the bilberry. Last year we made a Bilberry & White Chocolate Cheesecake with our foraged fruit. This time though, we decided to rustle up something a lot easier and opted to make a few muffins. 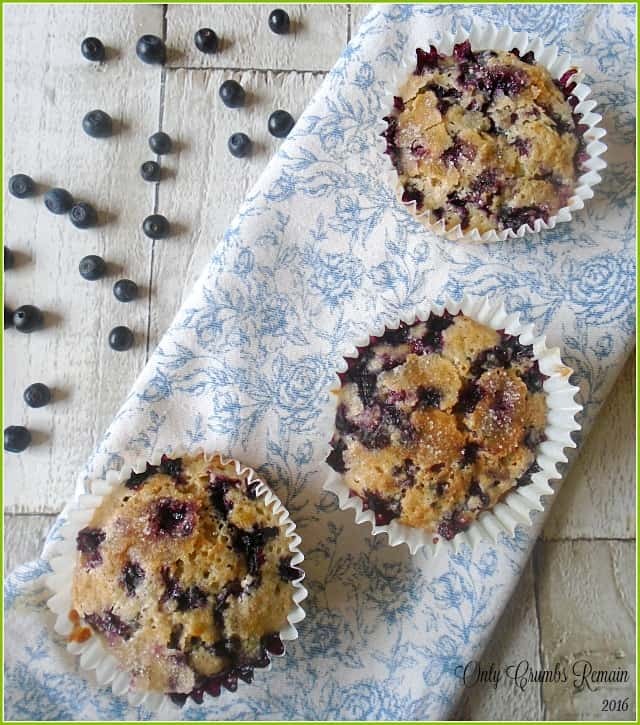 These Bilberry and Spelt Muffins are jam packed with delicious fruit and are topped with a little spiced sugar. 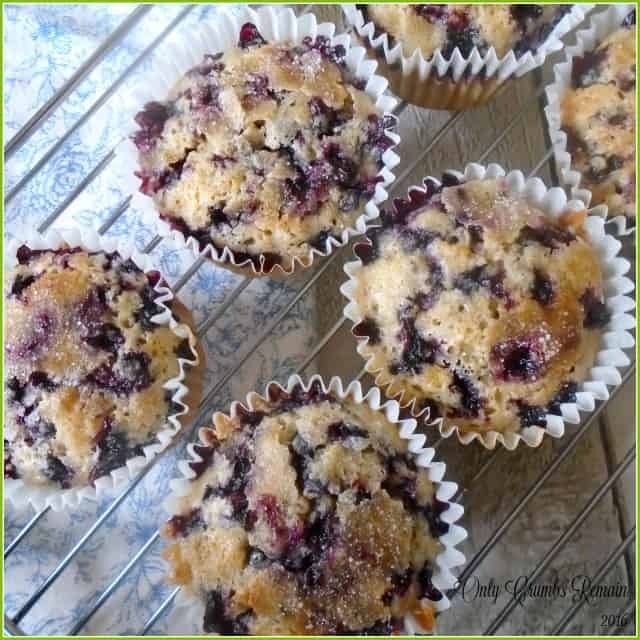 Having some spelt flour which had been languishing in the cupboard, I decided to replace the usual plain flour in favour of this tastier version, but of course plain flour would work equally well in these muffins. Many bakers comment that their fruits sink to the bottom of their sponge during a bake, but these little bilberries found their way to tho top (I’ve no idea why). To be honest I quite like seeing their purple noses poking their way though the Bilberry & Spelt Muffin crust, teasing us with the tasty delights to be enjoyed. Please only forage for food stuff when you are 100% sure of what you are gathering. Time: hands on time about 10 minutes; plus 20 – 25 minutes bake time; cooling time. 1. Prepare the bilberries. Gently wash the bilberries, removing any leaves, stems or spoilt fruit. Dry them gently with kitchen roll. Put them into a sided baking tray. Distribute the berries to make a single layer. Place the tray in the freezer for 10 – 15 minutes. 2. Pre-heat the oven to 200c / Fan 180c / Gas 6. Place the paper muffin cases into the hollows of the muffin pan. 3. Prepare the spiced sugar. Place the half tablespoon of sugar and pinch of mixed spice into a small bowl and mix together. Set aside. 4. Mix together the dry ingredients. Sieve the flour, baking powder, salt, sugar and mixed spice into a medium sized bowl. 5. Mix together the wet ingredients. Break the egg into a pyrex jug, or similar, and lightly beat. Add the milk and melted butter. Mix together. 6. Combine the wet with the dry ingredients. spatula or large metal spoon to gently combine, avoid over mixing. 7. Add the bilberries. Remove the frozen berries from the freezer. Tip them into the batter and gently mix to combine. 8. Fill the muffin cases. over the top of the raw muffin mixture. minutes. You may need to rotate the tray after 18 minutes of baking. inserted skewer (or tooth pick) comes out clean. Once the muffins are baked remove them from the oven. Remove them from the muffin pan and place onto a cooling tray to cool. Enjoy either slightly warm or cold. a) Freezing the bilberries for a few minutes helps to prevent the berries from being spoilt and damaged whilst being mixed. 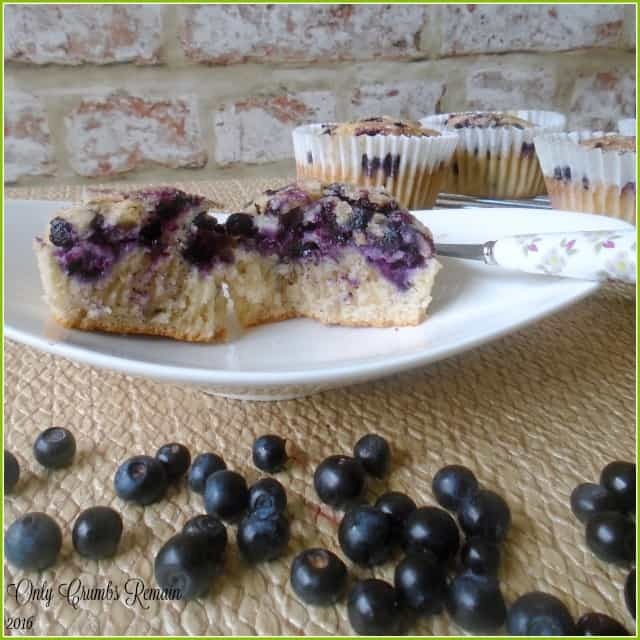 b) If you are unable to obtain bilberries, substitute them for blueberries, either fresh or frozen. Though if using fresh do freeze them for a few minutes before incorporating them into the batter. I'd definitely think you should find them in the North East Katie. We're in West Yorkshire, and I know that they grow well not only where we are but also in North Yorkshire and up into Scotland too. They grow on acidic soil (so likely to be found where there is heather), the bush is low growing which sadly makes it back-breaking work, so I try to forage from bushes which are growing on a slope so that I'm not stooping as much. Hahaha, it certainly was lucky Joanna and lucky that we had something to collect them in too 🙂 As far as I understand the bilberries grow in the northern hemisphere, but I may well be wrong. 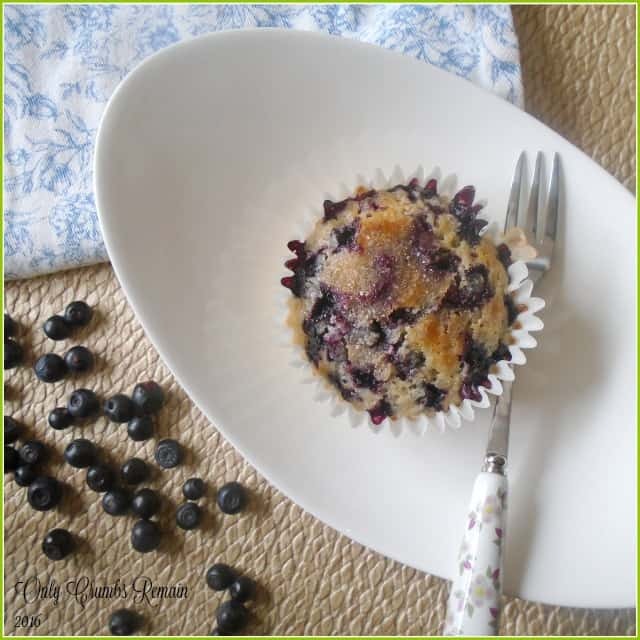 I definately think blackvurrants would work well in these muffins Kirsty. Ooh I'll second that hurrah Karen, bilberries are an amazing fruit, and I'm really looking forward to gathering a few tuperware boxes together and picking some more – this time enough for a pie I hope 🙂 Thank you for your lovely comment Karen, I'm looking forward to seeing what you rustle up. Spelt flour is great isn't it Vicki, though for some reason I don't seem to use it as often as I should. I'll have to up my foraging skills! Thank you for linking up with Treat Petite! Thank you Rebecca. I really should use spelt more often, it's such a great flour. They do look a little brulee like with the sugar having caramelised a bit. I love foraging for free berries Jenny, though I only pick what I'm confident about. There's so many other things I'd like to try but I don't want to risk making Mr E & myself poorly. I'm aiming to harvest some more bilberries and then I'll be keeping my eyes peeled for ripening blackberries. Hahaha, something like that Eb, infact I almost ran out of the muffins when I was taking bite shots because they were sooo good 😉 The spelt certainly did make them seem more healthy – even if it was just a phychological response. Ooh yes, definitely do keep an eye out for the bilberries Eb, they're amazing. The bushes grow on acidic soil and are low growing (so it can be back breaking work sometimes) – but thankfully the ones I picked for these muffins were on a steep sided slope so I was fortunate enough not to have to stoop to harvest them. I wish Royal Mail allowed food to be sent through the post so I could parcel some up for you et al because they really are tastier than blueberries. They look gorgeous and lovely and sticky on the top with all those bilberries poking through! I wish I had some growing near me! 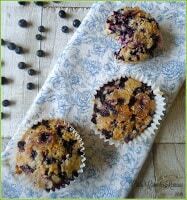 Your muffins look delicious Angela and I wish I could happen upon some laden bilberry bushes! !